Help a child in need and register for The Australian Running Festival! The Australian Running Festival has something for everyone. Choose to run (or walk!) 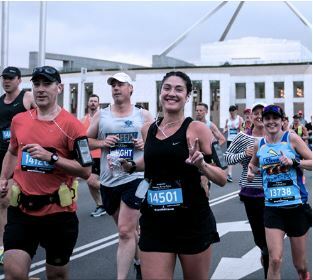 the 5km, 10, Half Marathon or Ultra Marthon course and discover the iconic sites of Canberra. You will make a difference this April when you register to run and raise funds to help disadvantaged children succeed at school. In just a few easy steps you will be ready to run and raise! Share your plans with friends and family - be proud of what you're doing, it's amazing! Raise just $250 and receive a running singlet, courtesy of The Smith Family! 2018 © The Smith Family ABN 28 000 030 179 All donations of $2 and over are tax deductible.